Brian Cody and his management team have named the team that will line out against Wexford this Sunday in the Allianz league fifth round re-fixed game. The game has a throw-in time of 2pm on Sunday in Wexford and both sides will be hoping to claim something from the game to ensure their respective league journeys continue. Click below for full details. Pre-purchase tickets are available up until Saturday night at selected Centra and Supervalu stores. Prepurchasing is advised. Tickets for the original fixture remain valid. 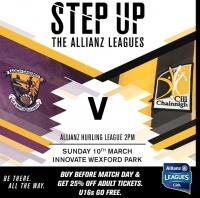 The Allianz league fifth round refixed game between Kilkenny and Wexford will now take place on Sunday next, March 10th at 2pm. The current state of the Division 1A table means its all to play for heading into the final round. Kilkenny will be looking for their third win of the campaign to secure a quarter final spot for 2019. Tickets are available in usual outlets (Centra and Supervalu), pre-purchasing tickets will ensure a saving of €5 and faster entry to the ground on the day. Tickets are also available online here. Tickets for the original fixture are vaild for his game. Click below for press release from Wexford Gardai/Wexford GAA (Re: traffic and event information). The Kilkenny team that will line-out Vs Wexford on Sunday in the Allianz league 5th round has just been named. Click below for full details. Kilkenny claimed victory over old rivals Tipperary in Thurles on Sunday with a one point victory, which secured all two points. Keeper Eoin Murphy scored two long range frees in the dying minutes of the game to help secure the win in what was a tight contest throughout. In the first half both teams were left to rue missed opportunites and the score was 0-9 to 0-8 in Kilkenny's favour at the break. The second half followed a similar pattern but Kilkenny stretched the lead to four points eight minutes in, only for Tipperary to recover and push ahead themselves. Not to be outdone Kilkenny fought the whole way to the finish, Richie Hogan claiming his first point of the league shortly after his introduction, followed by Eoin Murphy's two long range efforts before the final whistle sounded, Kilkenny 0-18 Tipperary 0-17. Kilkenny have named the team that will face Tipperary in the Allianz league 4th round this Sunday in Semple Stadium, Thurles, throw-in 2pm. Click below for full team news. Pre-purchase tickets on sale until Saturday night, €15. On the day Adults €20, Students/OAP's €15 and U-16 Free.